We’d love your help. 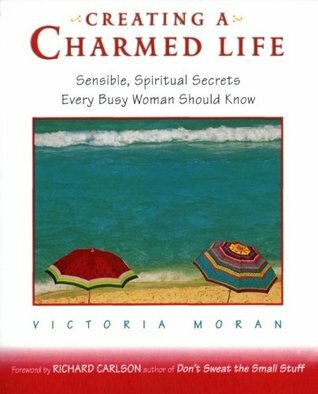 Let us know what’s wrong with this preview of Creating a Charmed Life by Victoria Moran. We all know-and envy-women who appear to live "charmed" lives. They seem to unhurriedly and effortlessly manage the whirlwind of their busy lives with grace and poise. Good things happen to them, and their lives are filled with serendipity, joy, and prosperity. But it's not a matter of luck, according to Victoria Moran; a charmed life isn't something tha How Does She Do It? We all know-and envy-women who appear to live "charmed" lives. They seem to unhurriedly and effortlessly manage the whirlwind of their busy lives with grace and poise. Good things happen to them, and their lives are filled with serendipity, joy, and prosperity. But it's not a matter of luck, according to Victoria Moran; a charmed life isn't something that happens to you-it's something you create! In Creating a Charmed Life, Victoria Moran unveils practical, spiritual secrets for expanding your capacity to love, know, and experience a fuller, richer life. Her insight, humor, and unassailable wisdom shine through each page to illuminate the magic in all our lives. To ask other readers questions about Creating a Charmed Life, please sign up. This compact book is filled with practical and sensible advice for women (and men!) who would like to create a charmed life, which the author characterizes as unhurried, effortless and filled with grace and poise. The subtitle of the book is "Sensible, Spiritual Secrets Every Busy Woman Should Know." The "secrets" are truly sensible—there isn't anything earth-shattering here. It is common-sense stuff that we all know but probably never take the time to remember or practice. The book is an easy read. However, implementing the secrets in your own life is the challenge. My advice would be to read the entire book and then choose two or three of the secrets that you need to work on the most in your life. Once you have successfully incorporated those secrets into your life, then choose a few more to work on. I suspect that before long, you truly will be living a charmed life. As I was reading, I kept marking page after page after page of things I thought I needed to work on. In the end, there were about 9 secrets that I identified as top priority for me. I'm a big believer that we can always be improving our lives and ways of thinking, and I thought this book was a wonderful tool for helping me focus on areas that need attention in my life. I can't imagine any person not finding at least one or two secrets that they would be able to use. Somehow the notion cropped up that we'd better do everything today. The idea took hold, and now almost everybody believes it. This is why so many women are running nonstop just to keep up. In a frantic attempt to realize their dreams, the dreams retreat and the frantic feeling takes hold. A charmed life is different, because you live it in chapters, the way you would read a long novel. When you're engrossed in a story, nothing exists except what is happening now. Even though chapter 10 is laying the foundation for chapter 11, the book only makes sense one chapter at a time. When you live your life this way—focusing on one chapter now, another later—you can devote more unfettered attention to what is yours to do at this time of your life, a time that will never come again. Look at the chapter you're now living: You may be in the college chapter, the crummy-first-job chapter, the home-with-small-kids chapter, or the second-career chapter. Circumstances can certainly make things more complicated and less clear-cut than these examples, but if you can keep in mind the main point of your present life chapter, you can give it priority. Chapter living is the rational way to "have it all," because when you live this way, you're not expecting to have it all at once. Its essence is paying close attention to the current chapter and not worrying about what you may be missing from prior or future ones. Their times are past, or yet to come. The key is letting go of the compulsion to pursue every possible opportunity right now—even if pursuing it means a crowded life, an alienated family, or a hospital stay for exhaustion. That old saying about opportunity knocking once is as archaic as the flat-earth theory and as patently untrue. Opportunity knocks all the time—and it rings your doorbell, calls you up, and sends you e-mails. There is more to this secret, but I think this excerpt gives you a good idea of the tone of the book and the type of advice you'll find within its pages. I adore this book! I discovered it quite by accident at least eight years ago in the "spa" section of a St. Paul gift shop. Since then, I've purchased and given away more copies than I can possibly count. Moran's words are gentle and inspiring; each chapter is easily read in just a few minutes. With every reading, I find more nuggets of wisdom than the last. Buy one for yourself, your mom, your aunts, your best friends---any woman who wants and deserves to live a "charmed" and wonderful life. A good friend of mine in college bought me this book, and i'll thank him forever for it. This is one of those books that as you read it, it all made so much sense that you couldn't see how you weren't living your life this way before. You couldn't help but smile and think about the way your life is already charmed! This book is filled with a treasure trove of knowledge and practical things to do to create a life full of magic and charm. It will be kept on my reference shelf so anytime I want to just pick it up, I can read from its pages for enlightenment and uplifting words. Without sounding over-confident, I have often had others ask me how my life seems so good. Of course, I have had really difficult times, but in general I am so happy. I never knew what to tell them. However, reading this book has really opened my eyes. A lot of the hints I already, naturally, have in place and really do contribute to my life being charmed. I also learned many new steps to making my life even more sublime. This book is all about giving you simple small changes th I adore this book! This book is all about giving you simple small changes that can make a big difference in your life. It is uplifting, charming and well written. I heartily recommend it to all. Terkadang kita berpikir bahwa hanya orang lain saja yang bisa memiliki hidup yang bahagia dan penuh daya tarik, sedangkan hidup kita sendiri biasa-biasa saja. namun sebenarnya, kita semua mampu membangun kehidupan seperti itu, di mana keberhasilan merupakan suatu hal biasa saja, dan hasil yang memuaskan bukanlah sesuatu yang luar biasa. Create A Charmed Life memberikan petunjuk untuk meraihnya. 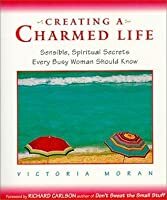 Buku “Bahagia dalam Kesibukan – How to Create a Charmed Life” karya Victoria Moran, bertujuan menjadika Terkadang kita berpikir bahwa hanya orang lain saja yang bisa memiliki hidup yang bahagia dan penuh daya tarik, sedangkan hidup kita sendiri biasa-biasa saja. namun sebenarnya, kita semua mampu membangun kehidupan seperti itu, di mana keberhasilan merupakan suatu hal biasa saja, dan hasil yang memuaskan bukanlah sesuatu yang luar biasa. Create A Charmed Life memberikan petunjuk untuk meraihnya. This book has actually been sitting on my bedside table for over two years. Each night, faced with reading this book or another, I would invariably choose another. I did manage to get halfway through, and today made the decision not to finish it. I suppose this book would be helpful to someone who has never read a self-help book before, but I found nothing I hadn't already read somewhere else. A Hallmark book stuffed with hundreds of "pearls of wisdom. The book is 2 to 3 page chapters on a variety of subjects such as: Follow Your Heart, Coexist Gracefully with the Unresolved, Live Your Life in Chapters, Breathe, Dance With Your Shadow, Sanctify the Ordinary. Giving to me from a friend. I plan to pass it on to my daughter. Lagi kecapean di airport nemu buku ini...trus di beli trus..di baca... Cukup menghibur dan ngasih banyak masukan untuk menghargai pekerjaan yang kita miliki. Setidaknya buku ini berhasil memberikan sedikit ketenangan di tengah2 jadwal kerja dan perjalanan yang gila2an. Recomended utk orang2 yang super sibuk dan kadang ngerasa kurang "beruntung" dengan kesibukannya itu..hehehe...(pas banget)!! A book that changed my life. True, it is one of those self help books...but not a long drawn out affair. You can open this book to any of the 2-3 page chapters and find something that will make a difference in your day. The author made me realize that how good a life you have is really defined by you. My friend's mother wrote this book and I went to a reading/signing of hers a few weeks ago. It is very well written and so far I am enjoying it a lot. I will write a more in depth review when I am done. Victoria Moran is a lovely writer. I like how she presents her advice, short and sweet, take ir or leave and very practical. This is the book that convinced me to really try and make the bed every day. All women must read this book. We need to lift one another up and remind each other of these principles. I have passed this book to my daughter with instructions to keep it moving through family and friends. Such an uplifting delight. This little book is not new, but is packed with wise, spiritually-oriented advice on how to live an optimal life. Chapters are short, ideal for reading before bed. Victoria's tone is warm and encouraging, taking commonsense topics and expanding them with a freshness that makes them sparkle. I adore Victoria's books. They are well written, eloquent and spot on. What shines through most is her passion and authenticity. I loved the little nuggets this book offered and will undoubtedly come back to its pages when I need some inspiration and uplifting. Couldn't continue reading it . It's very poorly written . It's like the author thought she is talking to her 10 year old kid .. Stacked a bunch of life bubbly advises ... ( which is close to listening to your mom lecturing you ) . Waste of time .. And money . Loved this little book of wisdom. It was full of stuff I really already knew but it was put in terms so much better then I could express. Wish I could have read it twice through but alas the Library doesn't seem to lend out indefinitely. I love this little book. It reminds me of all the things that are important and ways to eliminate a lot of the unimportant things that disctract me from the important ones. And it reminds me of how grateful for all the blessings and tender mercies that have made up so much of my life. I heard Victoria speak at a Women's Conference and was enchanted with her stories, style and sincerity. I immediately bought this book and devoured her wisdom. I have used so many of her delightful strategies for creating my own "charmed life." I have often re-read this inspiring book! This was a deep and inspiring book for me. I'd read a little and have to stop to contemplate. It's a keeper that I plan to reread every year or two. I loved this book. Optimistic and makes you think. Short stories can be read in between the bustle of life. Contained some inspiring ideas, but would have felt less overwhelming and redundant if the author focused on the ten most important instead of seventy four. It was sweet. The author means well. It's about self help, self encouragement and seriously makes you think about your life. I finished reading this, and although it is a lot like many of the other "make your life better" books, I liked so many of the suggestions. I believe I will be keeping it around for a while.